The very antiquity and richness of Persian culture renders the term "Persian dance" both vague and inadequate; it can be applied to a variety of regions, ethnicities and historical periods, making a strict definition difficult. “Persian dance” can range from sophisticated reconstructions of refined court dances to energetic folk dances. The movement vocabulary, costuming, music, demeanor, and context of these dances also varies widely. A brief examination of the genres of “Persian Dance” reveals the abundance of diverse dance styles in the Persian experience. The Persian nation, known today as Iran, has an ancient heritage and once governed a much larger geographical area than at the present. In 500 BC, the Persian Empire once extended to Egypt and the borders of India. Ancient Greek historians mentioned the dance of the Persians and in one account, Alexander the Great married the Soghdian princess Roxanna after seeing her dance at a banquet. The population of Iran includes many ethnicities other than the Persians themselves. In addition to numerous Iranian tribal groups, Kurdish, Uzbek, Turkmen, Jewish, Armenian, and others can be found within the borders of modern-day Iran. Each group, each region, and each historical epoch has specific dance styles associated with it. In Islamic society, dance generally suffers from low social status because it is often associated with immoral behavior not appropriate for a Muslim, such as drinking alcohol. Professional dancers were often Armenian and Jews, since proper Muslim girls would never dance in public before strangers. Like other areas of the Islamic World, Iran possesses four categories of dance, as first delineated by Louis Ibsen al-Faruqi. These genres are chain or line dances; solo improvisational dance; war or combat dances; and ritual or spiritual dances. As a result, the term “Persian dance” can include all four historical dances, folk dances, urban dances, and ritualized movement. Chain or Line dances are often named for the region or the ethnic groups with which they are associated. These include Bandari, Ghassemabadi, Qashqai, Kavkazi, Baluchi and Kurdi to name just a few. Bandari is a lively folk dance from the Persian Gulf region which contains strong Arabic and African influences. A favorite Ghassemabadi dance depicts women harvesting in the fields, mimicking work motions. The colorful layered skirts worn by women beautiful unfurl in their circle dances. With a population of 25 million Turkic Azeri people in Iran, the Kavkazi dances, like Lezginka, enjoy great popularity. A mesmerizing Baluchi bracelet dance was once part of the repertoire of pre-revolutionary Iran’s Mahalli Folk Dance Company. Dance is also central to celebrations of the Kurdish people with their various distinctive and energetic line dances. 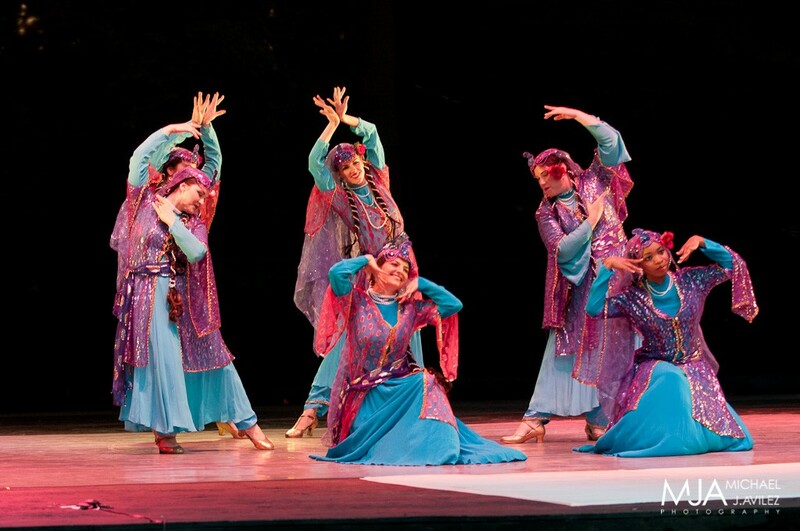 Solo improvisational dance includes historical “art dance” -- usually reconstructions of Safavid and Qajar Court Dance. These often utilizes delicate, graceful movements of the hands and arms, such as wrist circles. Animated facial expressions are central to the concept of naz, that difficult-to-define quality of alluring flirtatiousness that marks the best performers. Sumptuous costuming appropriate to the historical depicted features richly embellished silks, velvets and brocades. Urban dances focus less on communal line or circle dances and more on solo improvisational forms. Kereshmeh, Baba Karam and Shateri. In these dances, the charm and technical skill of the performer are foremost. Contemporary social dances performed at festive occasions like weddings and Noruz celebrations follow in this tradition, with each dancer interpreting the music in her own special way but within a specific range of dance vocabulary. More recently, Iranian emigre populations in the Los Angeles area have experimented with blending native styles with Salsa, Arabic, and Jazz dance elements. War or Combat dances are those that either imitate combat, or help train the warrior. The Shamshir, or sword dance, belongs in this category. It may be argued that the ritualized movement includes the famous athletic motions of men from the zurkhoneh of “House of Strength” also are a kind of martial arts training. Ritual or spiritual dances, such as those of the Sufis or devishes have been depicted in Persian miniaturepaintings. These dances bring to mind the mystic poetry of Jalaledin Rumi. These dance rituals are known as sama’ and also zikr. Certain general characteristics are shared by many folk and urban dances. Hip movements are sometimes used, but are quite distinct from those used Arabic dance. In Persian dance these motions sometimes twisting movements or a gentle hip push are often achieved by moving the legs; this contrasts with the true pelvic isolations of Arabic dance. Although accentuated shoulder isolations appears they are rarely sustained shoulder shimmies with the notable exception of Bandari. Just as the dances of Iran are unique and varied, so are the costumes traditional to each dance as well as the music that accompanies them. Certain melodies are inextricably tied to special dances, so proper musical selection is critical. Thus, “Persian dance” reflects a tapestry of cultures and a geographical spectrum as broad and as ancient as old Persian Empire itself. From the joyous abandon of Bandari to the studied nuance of a Qajar Court entertainer, the wide scope of Persian dance continues to enchant audiences in the 21st century, and for Westerners, offers a glimpse into the soul of an ancient people.